It's been before our noses for a year already ( 1 ): the weak colored arc reaching far outside the 46° halo in the display observed on the night of 5/6 November 2008 in Rovaniemi. I have thought of it as some sort of 46° supralateral arc extension below the horizon. But something has not felt quite right with that and I finally decided to run a simulation. 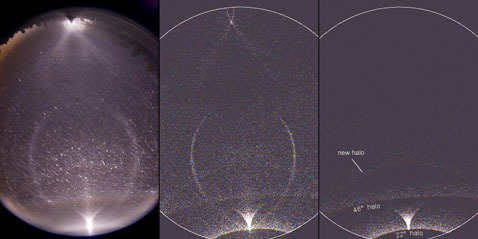 The halo arises in column crystals from 3-5-1 and 3-6-1 raypaths ( 2 ). Thus it is not 46° supralateral arc. Rather, these raypaths make it a reflection of 46° supralateral arc. If circumnadir arc had been visible in the display, this halo would have been tangent to it ( 3 ) similarly as normal 46° supralateral arc is tangent to circumzenith arc. The simulation above was made with column and random oriented crystals. Crystals towards triangular shape seemed to provide best overall fit with the photo. Light source elevation for the simulation was -11.5 degrees. The simulation on the right is filtered, showing some common halos together with the new halo arc. What should we call this? Reflected (46°) supralateral arc or sub(-46°) supralateral arc? If we were to choose the former, the "Ounasvaara arc" ( 4 ) which arises from similar raypath (8-4-1) in Parry crystals, could be then called reflected (46°) Parry supralateral arc. Simulations and crystal raypath figures are from Jukka Ruoskanen's software. I'm speechless again. It's amazing that there's still more to discover. Marko, hat's off. So this is the 8th new halo for Marko within two years? A record surely never ever broken in future. Congratulations! Extremely interesting finds. How much more hidden stuff might there be in the photos of last winter? Well, that was a surprise! Among all interesting features in last season's photos this one was one of the most obvious, but was left unnoticed. Good work. There is no more to be found at least from my photos. I have meticulously scrutinized them. This case visibility was loud and clear, but apparently nobody thought it could of significance. Yes, this was the eight new halo, Jari. But hey folks, winter is coming and who knows what will be discovered again. I saw that sub-supralateral in that one photo and I was waiting for you to find it. I got my 4th elliptical halo this year woot woot woot!! Thanks for leaving the discovery for me, Michael. And congrats on the fourth ellipse, that's pretty amazing. Two more to go to be even with Sillanpää. If not this year, next year you will make a new record. Thanks Marko I just got more halos today and the rare stuff was bright parry, bright 120d parhelia, bright 46d infra, and the shocker WEGENER ARCS!!! Sounds good, Michael. By the way, where are the odd radius display photos from last summer? We still have no seen them! Well darn I did not know you wanted them too or I would have sent you my odd radius pics. Maybe better understanding will suggest a reasonable name for the thing. Thanks Walt. That's a pretty thorough response. I am still trying to get my head straight with a couple of details on it, but I think I got the large picture. Maybe next you could do the family of 3-5-1 type 46 Parry arcs? I feel we should not write any papers on these new halos before Walt has provided his insight on them... The rest of us are little children playing with nice toys and Walt is the guy sitting on the bench and looking after us. Thanks, Marko, but, on the contrary, it is you who is leading the charge. Ok, think I got it! Took overnights sleep, though. The thing that bothered me was the different sized circles in figure 3. But now I see that they represent circumzenith and Kern arcs at different sun elevations. Smallest circle is equal to the sun elevation 32 degs and largest to sun elevation 0 degs. 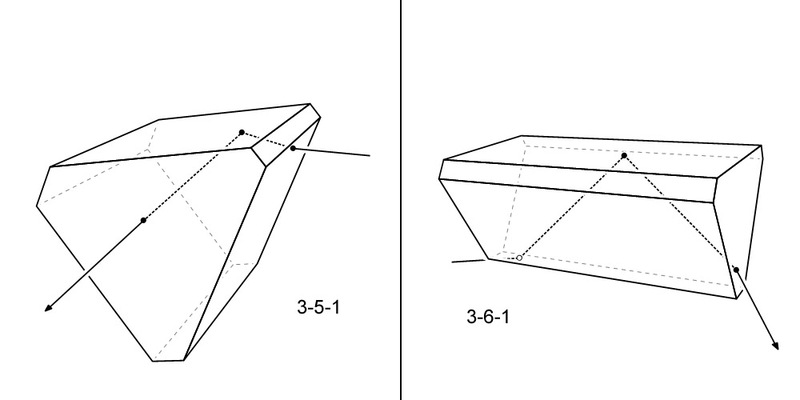 What size circle you get depends on what atzimuthal direction the crystal is pointing. Is that it? 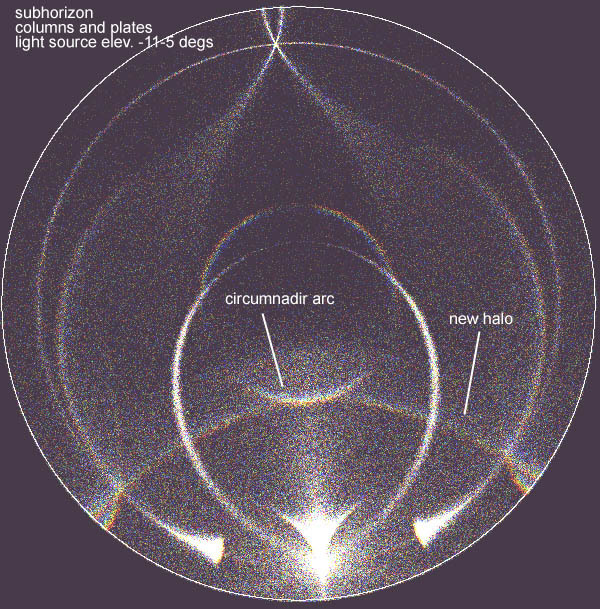 Now I am also starting to grasp what you said (in an email some time ago) about the connection of diffuse arcs and parhelic circle. Beautiful treatment allright! Especially fig. 6 is a magnificient illustration. Interesting graphics on the the reflected 46d arcs. Hey Walter have you ever got elliptical halo before? Yes, Marko, you had the idea exactly right in your 2009-10-30 @11:37 comment. And, Michael, you have probably seen more elliptical halos than I have. This takes another nights sleep to digest. Thank you very much for this easy to follow guide, it was very usefull. 4th Elliptical halo!! Yeah baby woot woot woot!! !